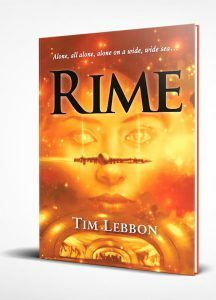 ← Tim Lebbon tells us his inspirations for his SF novella, Rime. I open my eyes and I’m still alive. It comes as a blessed relief and a welcome miracle, as it has every morning since I’ve been here. But then I remember the reason for my survival, and what came before, and guilt lands with the force of unknown gravities. I despair at the awfulness of it all, yet I can’t help but revel in my continued survival. The two emotions form the extremes of every waking hour. I am, as Luke insists on reminding me, a creature of contradictions. As if bidden by my thinking his name––and perhaps that’s true, because there are many aspects I have yet to learn about this amazing, almost unfathomable future––Luke walks through the door as if it wasn’t there at all. I have seen this a dozen times since my arrival, and a dozen times I have tried, unsuccessfully, to leave the same way. For me, the door remains solid. I’ve tried going out there as well, but have found no way to open the wide glass walls. Luke and the woman accompanying him walk straight through. I follow, feeling no hint of resistance at all. Once outside, I glance back briefly and see myself reflected in the glass, like a ghost from the past. I’ve been avoiding my reflection because it reminds me of what I’ve done. I see the sad, haunted man; the thin, haggard face; the long limbs, tall body, waving hair framing my sadness. Yet it’s the unmistakable glint in my eyes that troubles me most. The knowledge of a second chance. “Shall we sit?” Luke asks, and three comfortable stools rise from the balcony’s floor. “Who’s we?” I ask, looking at the woman. Like everyone I’ve seen here she’s very beautiful, and perhaps one day soon I’ll ask about that. It’s one more question whose answer frightens me. Luke’s smile drops. Olivia looks away, out from the balcony and across the staggering view that I usually see only through glass. Now, being out in the open air and involved in the view itself, it almost takes my breath away. The building I’m being kept in must be over a mile high, one of seven set across the wide, flat plain. Silent aircraft drift gracefully between towers on slender wings, and huge airships sometimes cruise in from the distance, emerging from the haze to park high above and disgorge their smaller cousins. A river flows across the plain, and the tall towers are built along its winding course. There are boats moving slowly along its length. Settlements speckle its banks, none of them large. Herds of creatures I can’t identify spot the ground, moving like shadows on my eye. Birds flock and swoop, and several times one or more have landed on my balcony, cleaning their feathers or scraping their beaks on the balustrade. None fly close now, not with us sitting there. I’m not surprised. It’s as if they know who I am. “I don’t think there was ever any doubt,” Olivia says. “You’re responsible for the deaths of seventeen million people.” She has no real expression as she states that stark fact. I can’t read her at all. I’m already doubting that they’re even human. “You can’t kill those that are already dead,” I say. Olivia sighs and looks away, as if I’m already a lost cause. “That’s not what the ship’s records hint at,” Luke says. He’s only repeating what he’s stated a dozen times before. Luke glances at Olivia and shrugs. It makes no difference. I know the truth, however unknowable it is. I stand and lean on the balustrade, looking down. The height is dizzying, barely visible vehicles crawling around the base of the tower like ants, wisps of cloud drifting past below. I wonder if there are real ants on this world. Once, several days earlier, I awoke to find a low cloud layer obscuring the entire landscape, only the protruding tower tops visible, sunlight making the cloudscape glow with a gorgeous, unnatural light. It was beautiful, but didn’t make me feel any more lonely than I already am. I wonder if they’re worried that I’ll throw myself from the balcony. I suspect there are safety measures I can’t see. And even if there aren’t, I would only be ridding them of an awkward, unprecedented problem. “It wasn’t my fault,” I say, tears burning my eyes because I know, I know, that all of it was. “Tell Olivia what you told me,” Luke says. “Just so that I know,” she says. “Luke thinks…” She glances at Luke, and it’s the first time I’ve seen anything approaching doubt, uncertainty, humanity. It confuses me even more. “I’ve told her you have an amazing story,” Luke says. I look out over that vast, incredible landscape once more, and wonder if I’ll ever feel that I’ve reached the end of my journey.